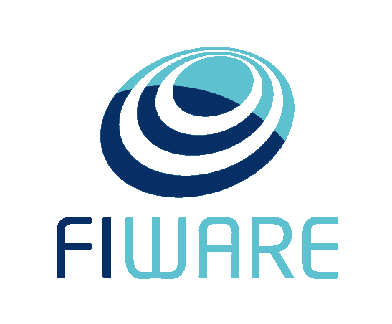 The FIWARE Catalogue is a curated framework of open source platform components which can be assembled together and with other third-party platform components to accelerate the development of Smart Solutions. 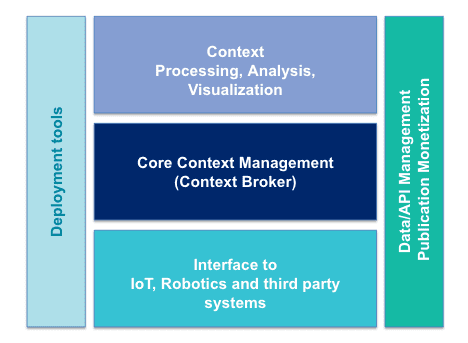 The main and only mandatory component of any “Powered by FIWARE” platform or solution is the FIWARE Orion Context Broker Generic Enabler, which brings a cornerstone function in any smart solution: the need to manage context information, enabling to perform updates and bring access to context. Interfacing with the Internet of Things (IoT), Robots and third-party systems, for capturing updates on context information and translating required actuations. FIWARE is not about take it all or nothing. You are not forced to use these complementary FIWARE Generic Enablers but other third platform components to design the hybrid platform of your choice. As long as it uses the FIWARE Context Broker technology to manage context information, your platform can be labeled as “Powered by FIWARE” and solutions build on top as well. To be adopted as FIWARE Generic Enablers, open source components must fulfil a number of contribution requirements described here. Technical direction of FIWARE is governed by the FIWARE Technical Steering Committee. The following sections describes the current list of Generic Enablers of the FIWARE platform structured in architectural divisions. Before you start setting up your own “Powered by FIWARE” platform, we suggest that you first try developing your first application using FIWARE and also review the FIWARE Tour Guide. To check out the source code of all of these open source projects and to view the latest test results of the Generic Enablers, go to the catalogue’s GitHub repository. IoT Agent library – library for developing your own IoT Agent. The Fast RTPS Incubated Generic Enabler has been adopted as default middleware in ROS2, the widely known Robot Operating System, therefore it helps to interface with robotics systems. The Micro XRCE-DDS Incubated Generic Enabler is an IoT-oriented middleware based on a publish-subscribe messaging pattern. The OpenMTC Incubated Generic Enabler brings an open source implementation of the OneM2M standard. A northbound interface with the Orion Context Broker is implemented as part of the product. The Domibus Incubated Generic Enabler helps users to exchange electronic data and documents with one another in a reliable and trusted way. The Wirecloud Generic Enabler brings a powerful web mashup platform making it easier to develop operational dashboards which are highly customizable by end users. The Knowage Generic Enabler brings a powerful Business Intelligence platform enabling to perform business analytics over traditional sources and big data systems. The Cosmos Generic Enabler enables a more easy Bigdata analysis over context integrated with most popular BigData platforms. The FogFlow Generic Enabler is a distributed execution framework to support dynamic processing flows over cloud and edges. The Perseo Generic Enabler introduces Complex Event Processing (CEP) defined using a rules-based system, enabling you to fire events which send HTTP requests, emails, tweets, SMS messages etc. The Keyrock Identity Management Generic Enabler brings support to secure and private OAuth2-based authentication of users and devices, user profile management, privacy-preserving disposition of personal data, Single Sign-On (SSO) and Identity Federation across multiple administration domains. The Wilma proxy Generic Enabler brings support of proxy functions within OAuth2-based authentication schemas. It also implements PEP functions within an XACML-based access control schema. The AuthZForce PDP/PAP Generic Enabler brings support to PDP/PAP functions within an access control schema based on the XACML standard. The CKAN extensions Generic Enabler brings a number of add-ons enabling to extend current capabilities of the world-leading CKAN Open Data publication platform to allow publication of datasets matching right-time context data, the assignment of access terms and policies to those datasets and the assignment of pricing and pay-per-use schemas to datasets. The Biz Framework Generic Enabler brings backend support to Context API/Data monetization based on open TM Forum Business APIs. Idra is able to federate existing Open Data Management Systems based on heterogeneous technologies (e.g. CKAN, SOCRATA, DKAN etc.) providing a single API and a standard metadata format (DCAT-AP) to discover open datasets. APInf API Management Framework is a tool for API owners to manage their APIs. It provides all the necessary features to run business with APIs and makes it easy for API consumers to find and start using the standard APIs.